Great Humidor. Beautiful wood, large and sturdy. I bought this for someone as a gift, ​and they loved it. It also came very well packaged. 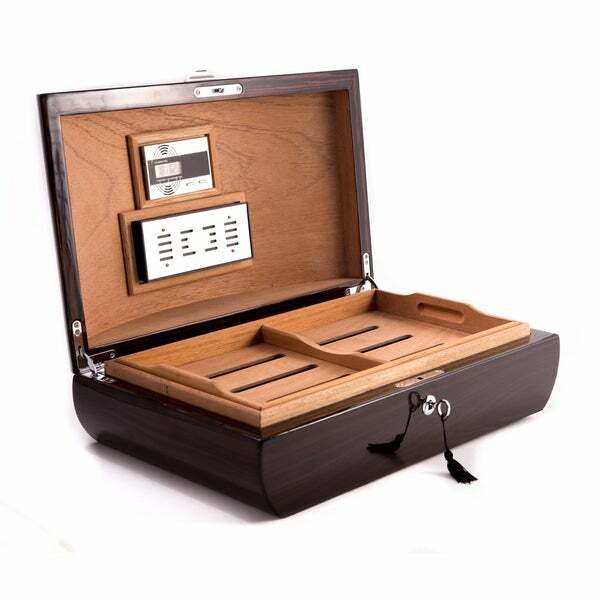 This elegant cigar humidor fits 100 cigars and is crafted of quality high lacquered wood. The rich brown finish completes the look. "yonkers ny. can this be shipped overnite? if so at what rate?" Unfortunately, we do not offer overnight shipping. Please enter your zip code under the delivery estimate and see the available options for shipping. "What type of wood is used to line the interior of the box?" Hello prncinghrse, it features a spanish cedar lining. Please let us know if you have additional questions. Thanks for shopping with us!